As a part of their Campaign for Real Beauty, Dove released this video that quickly went viral. In the video we see several women show up before a forensic sketch artist. The artist draws two portraits of each woman, one based on her description of herself and one based on stranger’s description. Later, women are shown both portraits to show them how much they underestimate their beauty. Inspiring, isn’t it? Nice try Dove, but I’m not buying it. Dear well-meaning, gushing internet friends that re-post this video with tag lines like “to all my beautiful friends out there” etc., slow down with the fervent praise. Before we delve into the message, let’s examine the messenger. Let’s consider Dove – a corporation, the primary purpose of which is profit. Profit, revenue, money, dough is the bottom line here and don’t let anyone tell you otherwise. In this case profit is gained by selling a line of beauty products. Dove sells beauty. Dove sells the idea of what beauty is. If suddenly everyone was accepted as beautiful or people simply stopped caring about appearances, Dove would go bankrupt. In short, Dove’s business model is based on women’s insecurities. But Miss X, you’d say, not every company is created equal, maybe people behind Dove’s campaign genuinely want to positively influence our culture! Corporations are people, after all, maybe they are awakening to their humanity, and maybe there are cancer-curing unicorns, and English majors have an 100% employment rate. All I’m saying is that it’s unlikely a business will invest in something that will undermine their market presence. Indeed, a little research shows that Dove as well as Axe and Fair and Lovely are owned by the same company Unilever. Most people are familiar with Axe and their obnoxious series of ads, that feature slim, scantily-clad, overly-sexualized objects women. However, not everyone knows what Fair and Lovely line of products are all about. They sell skin-lightening cream, mostly in India. They benefit from (and promote) the racist idea that light skin = beautiful in a country where most people are of darker complexion. In the video above, we see a beautiful unattractive fair dark-skinned Indian woman who apparently gets rejected from working (F&L: must be this white to earn a living) at a beauty salon because one look at her will make clients run the other way. She is consoled by her father and given Fair and Lovely treatment. She enters the salon a conqueror and even attracts the attention of (gasp!) a western man. She also earns the love of her father, because a woman has to get approval from at least two men to be happy. Isn’t being white the best?! (It is). THE FOCUS IS STILL ON BEAUTY! In the Campaign for Real Beauty 2013, (beautiful) women are told that they are more beautiful than they think. The assumption is, beauty is the most important thing about a woman. The ad does not talk about what these women do, what they are like. Are they good people? Do they create wonderful works of art? Do they work as scientists, managers, editors, engineers? Do they volunteer to be a mentor for at-risk youth? Who cares? They are beautiful! Let’s look at the women that the Campaign has used in their ads. The most recent one: none of them are overweight, none of them have disabilities, none of them is particularly unattractive (arguably all of them are beautiful). They did invite older women (but none older than 40’s because who wants to see that?) and women of color. However, WOC did not get nearly as much screen time as white women. In addition, the words the strangers used to describe what was beautiful about these women were anything but subversive – “thin chin,” “beautiful blue eyes,” “cute nose.” The women who got most screen time were slim, fair, blond, and blue-eyed. Radical and inspiring? I think not. Can you spot the stretch marks? Neither can I. This photograph is supposed to endorse women of all sizes and shapes. Let’s see, we have the token black woman whose skin is so photoshopped and airbrushed, she could just be a tan white woman; we have the token “big” woman, who in no way is actually overweight or represents the majority of American women (64% of American women are considered overweight, and 36% obese)*. This ad is about celebrating diversity, it screams “these are real women, not models!” Yet all I can hear is, these women are not perfect models, and if I am fatter than these women, I am nothing. It’s OK to be fatter than models because we know they are all unrealistic depictions of what we should all strive for. But these are “real women,” and if I can’t even measure up to them, I must be beyond help. Don’t know about you, but it just makes me aware that all these qualities can be considered unattractive by someone and therefore must be remedied. 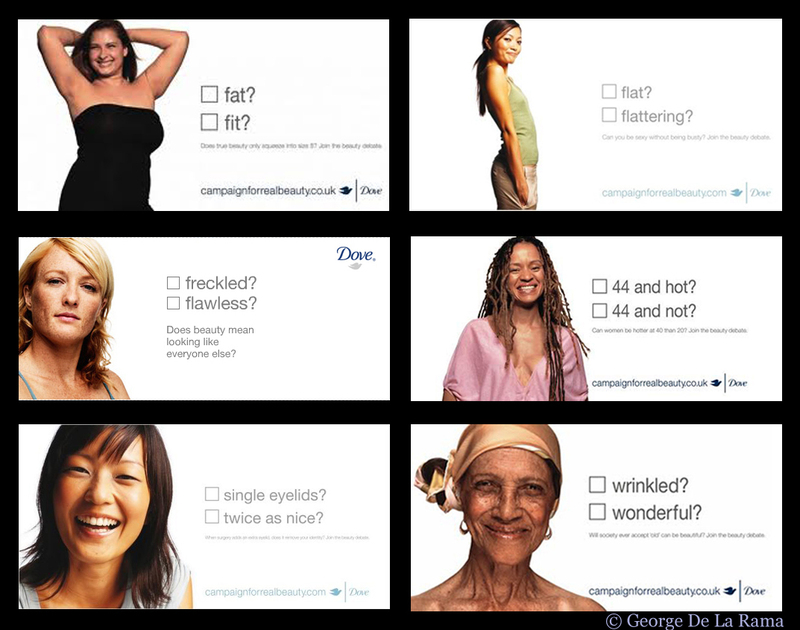 Dear Dove, we appreciate you trying but you have to try harder to include minorities (and actually give them equivalent exposure and screen time), older women (yes, older than 40), women with disabilities (what’s an extra chromosome? ), women who are actually overweight, trans women – all the women who require a little more acceptance in our society. And maybe, just maybe, you can focus on real beauty instead of appearances. Excellent points. I like that you’ve gone back through their previous campaigns to show the trend of flaws in a so-called Real Beauty initiative! When I was visiting Nepal, they had Fair and Lovely ads up all over the place. Big roadside banner ads, etc. At the time, there had been petitions, etc, to get Dove to stop selling that stuff, but it never worked. I didn’t remember the Campaign for Real Beauty. That’s totally gross. Makes the same points you did, but also points out that the women all appear to be stylish, clothing-wise, and their attire shows that they’re probably not poor. Just one of the many ways that a supposedly broad campaign ignores the marginalized. Thought-provoking critique of Dove’s Real Beauty project. You’re welcome! I really liked what you said here. Good points, but honestly I still appreciate their effort. I think their videos start a conversation, and that’s a really crucial step. Yeah, I think it’s hard to criticize this campaign and not come off as a person who tries to be offended by everything. But I think we can appreciate the effort AND still point out its shortfalls.